As a part of chiropractic care treatment, it’s essential for individuals who frequently suffer from joint and/or muscle pain due to direct trauma from an injury or an underlying condition to continue keeping their bodies as flexible as possible. People who often workout to maintain or improve their flexibility are actually at a lower risk of experiencing an injury or aggravating a condition. According to chiropractic, the best way for an individual to control their flexibility is to stretch before starting any physical activity. Before stretching however, its also important to note that each individual should warm up their muscles prior to stretching. Stretching first can often result in further injury because the joints and muscles are pushed beyond their limit while the tissues are stiff and not yet loosened. Participating in a few low or no impact workouts, such as a simple walk, can be enough to warm up the body lightly. A chiropractor can also recommend an appropriate series of stretches and exercises according to each individual’s level of symptoms or injury. Once you’ve made sure to warm up your body properly, you can begin stretching. There are two basic forms of stretching: static stretching and dynamic stretching. Static stretching, is defined as focused stretches of the muscles used while the body is at rest that loosen up the muscles by holding a certain position for a determined amount of time. Dynamic stretching, is defined as focused stretches of the muscles used by building momentum to move parts of the body by pushing the muscles to extend their range of motion while making sure not to exceed the individuals normal stretching capacity. 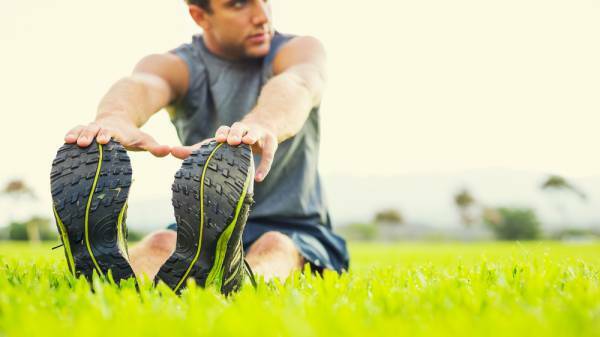 Both types of stretches are important towards enhancing one’s flexibility although a majority of people often use static stretching over dynamic stretching. Many of the most effective stretches for correcting symptoms of back pain among others, can be practiced at home. A common stretch frequently recommended by many chiropractors is known as the cat pose, originating from yoga. To perform this stretch, first, bring your body down with your hands and knees against the floor while keeping your hands aligned underneath the shoulders. Then, let your abdomen drop down towards the floor and reverse this movement by arching your back. Repeat this process three to five times. Another simple stretch to use involves the individual to lie on their back with their knees bent. To perform this stretch, first, grasp a single knee in both hands and pull it towards your chest. Maintain this position for approximately 30 seconds and return to the original starting position. Repeat this process with the other knee. Using this stretching exercise with both knees at the same time can also work just as well. Another stretch can be used similar to the previous stretch exercise. To perform this stretch, first, lie on your back but instead of bringing your knee to your chest, roll both legs to one side, bringing your knees as close to the floor as possible and hold this position for 10 seconds, then roll your knees to the opposite side. Another stretch that can essentially be beneficial for stretching your back muscles is known as the scorpion stretch. Tor perform this stretch, first, lie face down while extending your arms out to the sides of your body. Then, gradually move your right foot towards your left arm and then, gradually move your left foot towards your right arm. Make sure to move slowly and according to your stretching limits in order to avoid injury. Individuals who frequently suffer from joint and/or muscle pain are usually recommended to stretch in the morning and in the evening. Adding these stretches into your daily workout routine can help any individual avoid many common injuries as well as maintain and improve flexibility. Before performing any type of physical activity however, always make sure to consult a chiropractor or other medical specialist to diagnose any possible injury or underlying condition in order to determine the appropriate set of stretches and exercises best recommended for you.